In order to improve the work performance of construction industry and to generate value added employment opportunities, Construction Industry Development Council (CIDC) as the apex organization representing the Government and the construction Industry, had initiated a country wide Human Resource Development initiative focused on developing a formidable work force to fructify various Infrastructure Development Projects in the Nation and also abroad. Over the last 13 years CIDC has made substantial achievements in the area of HRD especially for construction workers, Artisans and Supervisory cadre personnel. The programme is now spread over 19 states and supported extensively by various State Governments. The support from the State Government has come by way of provision of physical infrastructure, 29 ITIs, nomination of learners under various central and state schemes such as NREGS, Chattisgarh Raj Mistry Yojana, Vocational Training for candidates belonging to SC/ST categories and training of Jail inmates. 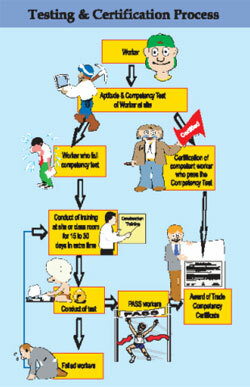 Over 250,000 personnel trained, tested and certified by CIDC for their skills. Almost 100% have found value added appropriate employment with leading industry organizations. The course structure is developed as per the exigent needs of the clients / industry looking at the market dynamics and latent demand in the region. Certain trades like masons, carpenters, electricians have a universal appeal and shortages are more pronounced in certain geo-political regions. However, looking at the massive demand for construction personnel at all levels and the skill shortages being faced by the industry due to high ingress of technology, the 47 trades listed below are the chosen ones by CIDC for dissemination of these courses. CIDC’s attempts to make the programme boradbased and all inclusive that caters to the weaker sections of the society. This programme also has a strong rural appeal and helps in poverty alleviation and improvement of livelihoods. Duration of the course (Hours and in weeks):The ideal course cycle is for 3 months per batch. This is inclusive of the particpant orientation, pedagogy and hands-on-trianng. The site visit and fimalirazaytion with toolkits and their practicasl applicxations are also handled by the instructors dutring this period. The short and concise nature of the scourse delivery has been field tested and worked out on the principle of catering to the lowest common denominator. 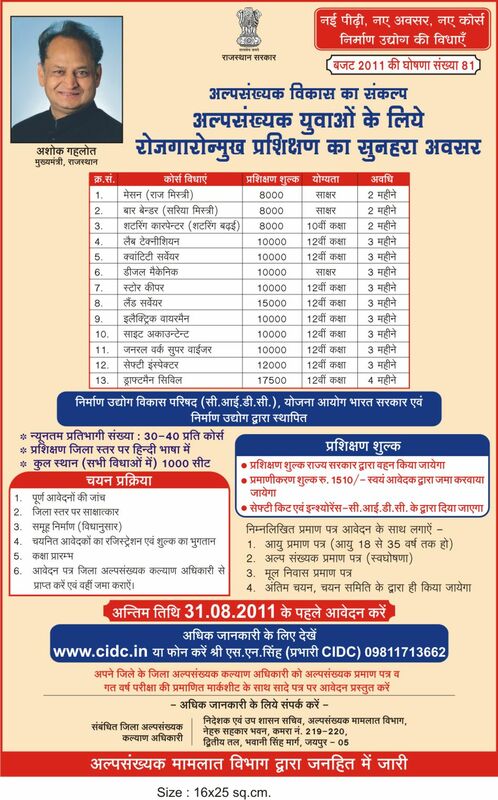 This is developed as per the curricula and syllabus for each trade. The practicum involves going to the site ot understand the nucnaces of the trade and often includeds practical demonstrations of the tools including explanation of saftey aspects on how to use them. Their effective handling methods to gain maximum throughput are demonstrated and trainess handle the tools for a first hand expereicnce. The cousres are both flexible and scalable with the option of incorporating local influences and nuances to cater to a wider audience. The exignet requirements of a particular geo-political region or socio-economic catchment warrant that the course delivery be modified as pe rthe exigent needs and CIDC team is well versed to cater to this demand. All CIDC training centers are equipped with course material, training kits and well trained staff to cater to the express needs of the students and often the teaching material is developed in vernacular to make the message well understood.